This banjo is a great companion for travel. With a 9″ pot and 20″ scale, it fits nicely in an A-style mandolin case, and is a breeze to travel with. Pot is a block rim of Sapele with wenge rim cap and cherry top layer, supporting a 1/4 inch brass rod tone ring. 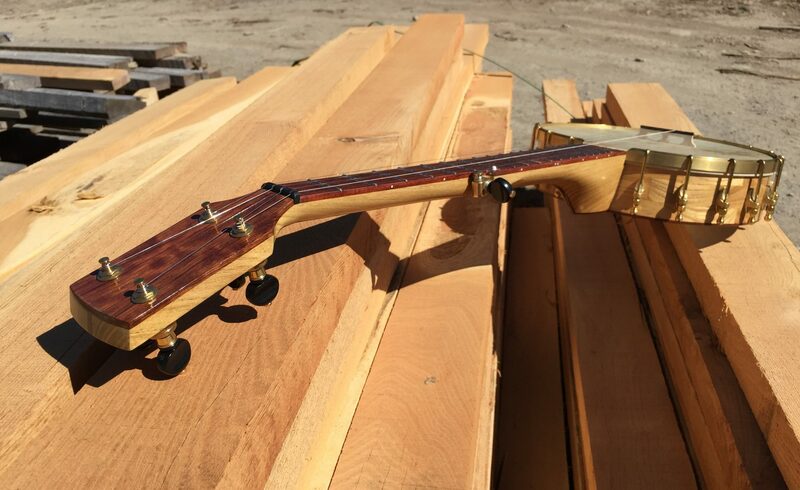 Neck is Sapele, with Padauk fingerboard and Wenge headstock and heel cap. For a small banjo, it has a nice full voice and strings are gauged for tuning in A/D. I like to muffle the strings south of the bridge with felt or rubber band. Set up with goatskin head, curved Beartown bridge. In a group, this banjo doesn’t have the volume of an 11″ pot, but it sounds great and is sweet to play.